Focus Audio Visual, in South Bend, Indiana serving Northwest Indiana, Chicago, IL, and Western Michigan, is equipped to offer turnkey AV furniture and equipment management for both the corporate and school environments. In fact, we'll create the completely new, highly productive audio visual environment itself. The LearnLab is a prototype of new applications equipped with audio visual technology and products that addresses rapidly changing classroom and office AV needs apparent throughout observation studies conducted by Steelcase, a Focus Audio Visual partner. Classrooms have traditionally been designed to support one style of teaching, when in fact they serve a variety of functions. Colleges and universities face pressures coming from the high expectations of a discerning new customer — Generation Y, otherwise known as Millennials, Nexters, and the Internet Generation. Imagine a classroom that improves the transfer of knowledge, dramatically enhances collaboration and engages multiple learning styles. The LearnLab Environment actively supports the many ways that students learn today. The LearnLab grew out of a user-centered AV furniture and equipment design process developed by Steelcase Workspace Futures group to fully understand the needs of today’s students, faculty and improving the classroom experience. Their research process borrowed heavily from practices in cultural anthropology and ethnography as other methods such as those practiced by IDEO, Intel, Nike, Target, Pitney Bowes, etc. Key learnings from the research include the following: classrooms more than ever need to support multiple teaching and learning styles; the application of products and tools in the classroom is critical to how well students and teachers use them; better display of information is translated into better retention for students. The layered technology, that LearnLab is testing, is a wired floor, multiple digital projectors, and easy access to large display. 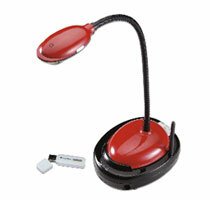 Students can also digitally communicate using their personal laptops to any projector in the room. They have access to the Internet and the school’s intranet. Digital collaboration has had an enormous impact on the way students work individually; however, when group work is required, individual technology does not adequately adapt to meet group needs. Having a shared space that supplies collaborative tools within easy research can help the team to be more effective. Projection screens in the rear of the classroom can be networked to student computers to provide visuals for group dialog. Technology allows team members to annotate directly from the larger projection and save notes to the networked computer. Through the integration of audio visual furniture and technology, media:scape is reshaping the way people collaborate in a connected world. media:scape boosts collaboration across the table or across the globe – by transforming classrooms, libraries or social spaces, connecting students and employees, and sharing information seamlessly in dynamic new ways. Most collaborative spaces today support leader-led presentations where information is controlled and shared by one person at a time. media:scape removes these barriers and democratizes how people access and share information by allowing all participants to contribute their ideas – equally, quickly, and seamlessly. Open and private spaces. Small, medium, and large spaces. Formal and informal spaces. Every media:scape worksetting includes advanced furniture and components that are easy to install and easy to use—no software, drivers or special training is required. An infinite number of configurations are possible. It's also completely mobile. media:scape mobile is a new addition to the media:scape family, transporting the media:scape experience anywhere in an organization. It can bring media:scape to a diverse range of settings, wherever collaboration may occur. It can be placed on top of virtually any surface to transform the space into a high performing collaborative workspace for up to four people. Focus AV can help implement and support media:scape as an authorized Steelcase dealer in the Northwest Indiana, Chicago, IL, and Western Michigan areas, to improve most any corporate or classroom work setting. Focus AV is proud to represent Polyvision, a Steelcase company, with its ēno state-of-the-art interactive whiteboards. 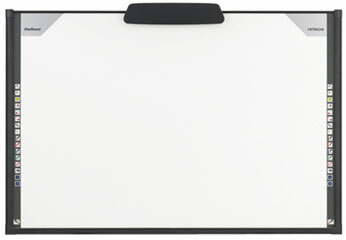 It combines an interactive board, a high-performance dry erase board, and a magnetic surface into a single solution. The ēno classic is the first and only environmentally certified interactive whiteboard to combine the simplicity and ease of a traditional markerboard with high-performance interactivity—without cords, cables or costly installation. The ēno one combines an eno whiteboard, ultra-short throw projector, and stand or mount in a single solution from one provider. With magnetic mounting hardware and no cords or cables to manage, ēno click by Polyvision mounts instantly over an existing ceramicsteel chalkboard, whiteboard, or any other steel surface. 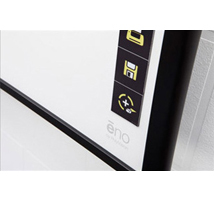 Featuring industry-leading e3 environmental ceramicsteel™ surface, ēno classic offers an exceptionally smooth surface for dry-erase notes that erase today and 30 years from now. ēno classic adheres to stringent environmental certifications, is made of recycled materials and does not draw from power outlets. Installation in a new or existing space is reducing your carbon footprint. Forever Warranty™—The board is made with PolyVision’s legendary e3 environmental ceramicsteel surface, built to withstand the hard knocks of classrooms and conference rooms. It’s built to last as long as your building. The following interactive whiteboards by Hitachi could also be a proper solution for your organization. Focus AV has partnered with PolyVision, a Steelcase company, and Dukane's Convey Solutions to help engage your K-12 and higher education students and corporate employees, creating collaborative lessons by incorporating student response systems into your interactive classroom lessons. There are no wrong answers when it comes to measuring student learning. Multiple choice, open-ended and true/false are just some of the options. This technology can enhance the connection between teacher and student for truly productive learning. In a business environment, training events will be more riveting with all of your employees more involved in the discussion. Multiple branches or business offices? We can connect them all. Interactive whiteboard systems, digital visualizers, and digital projectors all can be employed for maximum effect in view of your unique setting as well. We can also harness the power of cloud computing to drive the assessment system, gathering data from across the organization for analytical purposes. Use existing devices (iOS, Android, laptops, etc.) as response pads. You don't have to buy additional hardware. 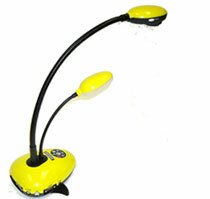 Trainers can use with PowerPoint without changing slides. Simply create an answer key and go or ask spontaneous questions without an answer key. Coordinate rosters with your HR department which makes for easy session setup. Create corporate accountability easily check to see that all employees have taken required training. 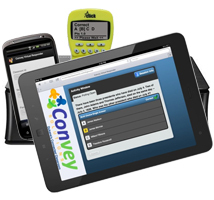 Aggregate data (collect the response data across all your organization's locations, branches, offices) so you have easy, convenient and instant access to training data. 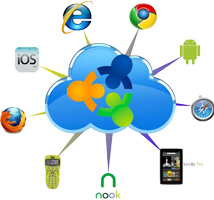 Training data stored on the cloud. If you're looking for a visual presenter or document camera system that focuses on the quality, functionality and flexibility you need, we have it in the Dukane models featured above. To make even better presentations, consider the quality of the Dukane visual presenters, packed with innovative features for the excellent lightness, brightness, sharpness, clarity, and contrast that you'd expect from today's AV technology. 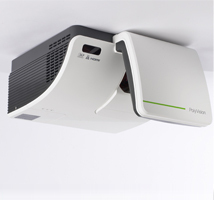 Supplying a wide range of versatile document camera systems and visual presenters, Focus AV will find the right model for the on-the-road presenter, a large auditorium presentation, or the teacher classroom presenter. Put our product knowledge and audio visual equipment access to work and expand your selection options, making your job easier. Our visual presenters feature switchable A/V Inputs, so you can have the freedom to change from computer to video input. 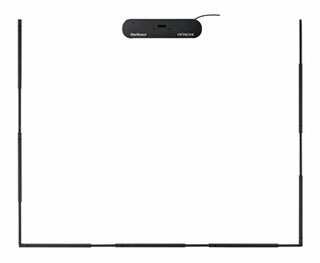 The Dukane smart document camera also can carries an 11X power zoom lens, so you're able to display materials such as B4 documents and 35mm slides. 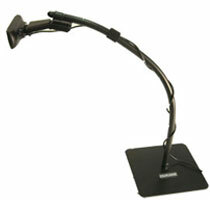 HD visual presenters are also available. 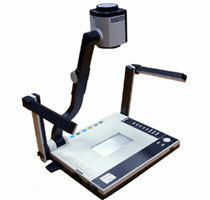 The Dukane Camera 445 is the first multimedia visual presenter capable of producing HD (high definition) images. Equipped with a dedicated powerful processor, the 445 will thrill even the most sophisticated user with features such as 1,080p HDMI output, an audio-video processor for full-frame video recording to SD card or computer, ultra-sharp 6× optical zoom, unparalleled true UXGA output with extended gooseneck, and dual lights for optimal illumination. 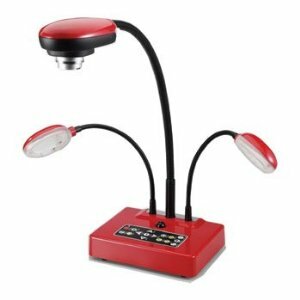 Key features and benefits: High resolution UXGA (1,600 × 1,200), *Optical zoom, 6×; digital zoom, 4× *USB 2.0 for fast image transfer *Autofocus for convenience *Dual fluorescent lamps provide cool light and enhance image color *Remote control for convenient operation *Built-in storage for 240 images *Video recording with built-in microphone *QueueTM image capture software permits full-screen image reviewing, annotation, and video capture with Windows® 2000/XP/Vista/7 and Macintosh® OS/X.